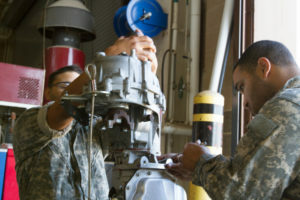 FORT HOOD, Texas,—Mechanics with the 504th Military Intelligence Brigade fill their maintenance bays with various types of equipment such as Mine-Resistant Ambush Protected vehicles, High Mobility Multipurpose Wheeled Vehicles, and trailers. 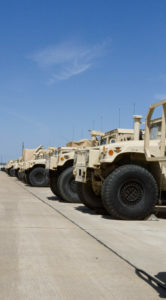 In the unit’s storage area for military vehicles, known as a motorpool, hundreds of vehicles are lined up ready for use or maintenance. In 2015, the 504th Battlefield Surveillance Brigade became an Expeditionary Military Intelligence Brigade. Expeditionary units in the military are units that have the capacity to rapidly deploy anywhere in the world. Due to the change, the 504th has an excess of equipment, said Chief Warrant Officer 3 David Hiniker, the brigade’s Property Book Officer. At one point, the unit had more vehicles than personnel. Soldiers would spend an excess amount of time making sure the equipment was operational, and with that, they would often find maintenance faults. As part of the Army’s readiness priorities, the goal is to maximize every dollar and asset used in a wise manner. The Secretary of the Army and Chief of Staff of the Army reported to Congress on March 15, that to meet the obligation of reforming the Army, the Army needs to assess how it utilizes time, manpower, and money. Divestiture is a part of that process. Within the past year, the 504th has divested $15 million in excess gear, said Hiniker. At the start of the process there were over 1,100 vehicles and other items the brigade did not need. The brigade is currently down to about 450 items; and moving forward, the 504th plans to divest another $14 million worth of equipment. The MTOE is a Headquarters, Department of the Army document that outlines what a unit is authorized to have on hand for all prescribed equipment. The divestiture process also decreases the backlog of work, said Hiniker. Soldiers are able to enhance capacity and reliability of on-hand equipment by maintaining a lesser amount. This process so far, has met several key priorities for the U.S. Army by decreasing the funding spent on maintenance, which frees up manpower and time. Staff Sgt. Velkis Charney, the supply sergeant for Headquarters and Headquarters Company, 504th MI Brigade, said her role in the brigade’s divestiture process is to receive a directive for the transfer of equipment to another unit. She then contacts the receiving unit to see if they are still interested in a transfer. If the oncoming unit is no longer interested in the items, the supply sergeant and property book officer attempt to find another unit that may be interested in the items, said Charney. If no one is interested, then supply waits for the need to arise elsewhere. The unit mechanics complete a turn-in inspection, which lets supply know what shortages the items have, said Charney. Some items are turned in “as is”, while other items need to be fully mission capable before turn-in. Charney said the 504th has sent items to areas such as Fort Bliss, Texas; Fort Sill, Oklahoma; Hawaii; Fort Leonard Wood, Missouri, and other various locations.